The Championship game is upon us. The Capital Weather Gang and National Gallery of Art have both been going strong since the tournament kick off and have bested some top seed favorites. 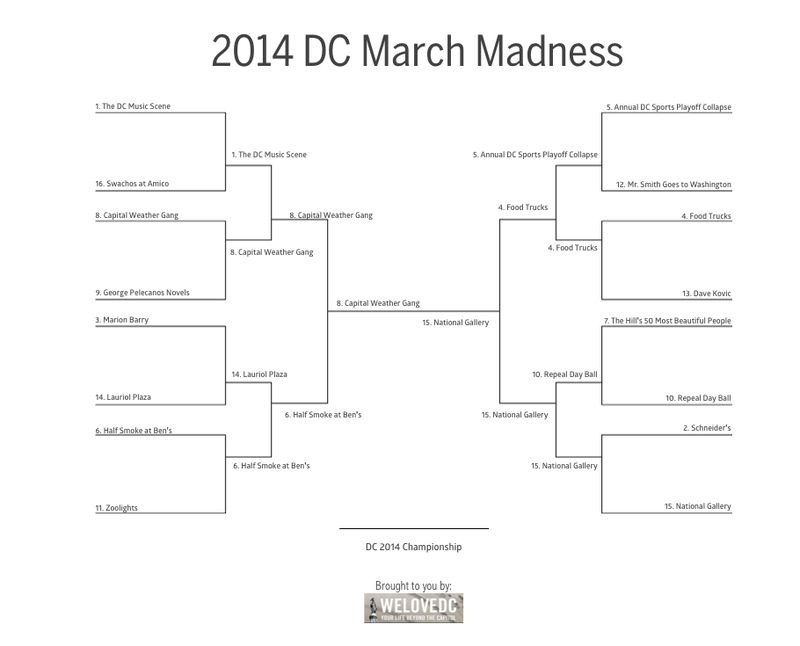 It will be very interesting to see who pulls off this win and takes the crown as the 2014 DC March Madness Tournament Champion. You’ve got until 11:59pm tonight to cast your vote. #8 Capital Weather Gang: This gang of weather nerds is the area’s go-to team for (mostly) accurate news and information on the region’s weather. Actually, it’s really one guy surrounded by a bunch of weather-loving people – but to us, they’re the Gang. They do their own forecasts, analyze models, insert physics, and use their own knowledge in formulating forecasts that are more often than not, right on target. They update their blog on WaPo with reader photos and comments, stay on top of updates during big weather events, and are highly interactive. They’re clear without being condescending; they answer all your questions without your even asking. They tell you what they know and what they don’t. They know they’re not perfect and aren’t afraid to admit when they’re wrong. Best of all? They show you how the science is relevant and uncover its beauty for all to enjoy. 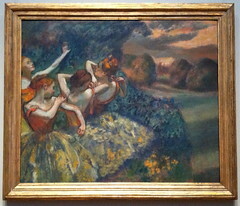 #14 National Gallery of Art: A perennial powerhouse, the National Gallery isn’t just one of the finest museums in DC, it’s one of the finest in the world. It’s easy to lose yourself in the West Wing’s (no, not THAT West Wing) collection of Dutch masters, although my favorite works in the building are the Rodin sculptures. Ride through the tunnel to the East Wing and take in a Matisse and some Calder mobiles and you’ve got yourself a lovely day. This year’s news sees the National Gallery potentially taking over the Corcoran’s collection (subject to approvals, of course) so expect a higher seed next year if that goes well (and if we repeat this idea). 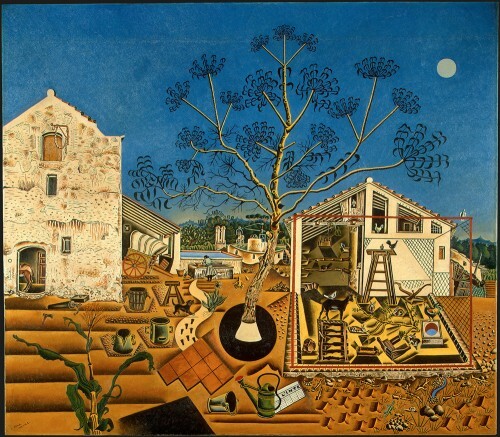 Whatever your preconceived notions of Miró might be, put them on hold and head to the National Gallery of Art. The NGA is the sole U.S. venue for Joan Miró: The Ladder of Escape. A massive exhibit, it highlights the artist’s political side and undying loyalty to Catalonia throughout a lifetime of hardship under two world wars, the Spanish Civil War, and the Franco dictatorship. I had the chance to visit when it opened on Sunday. Last weekend the National Gallery of Art reopened the Nineteenth-Century French Galleries, which contain works by Manet, Monet, Renoir, Cézanne, Van Gogh, Gauguin, Modigliani and Picasso. The gallery now organizes the paintings thematically and provides textual panels to help visitors understand the reasoning behind the new groupings. In addition, thirteen of the paintings have been restored. I went last Saturday and was blown away by both the beauty on display and the enthusiasm of the visitors around me. In fact, I was so amazed by the Cézanne pieces that I ran out of time and missed Monet. However that shouldn’t be a problem: the NGA’s price tag (always free) and nearness to Metro mean I can always…Gauguin. Yes, that’s a little Post-Impressionist humor for your Friday. There are parts of me that will forever be trapped in the past. Even though I’m technically an adult, I’ll always feel like a kid in one way or another and rarely take life too seriously. As long as I can pay my bills and stay out of prison, I might as well have some fun right? We’re only on this big blue marble for a short amount of time, which is why I like to move to different cities, meet new people, learn about different cultures, and photograph what I find interesting. I often think back to when I was young to try to remember how I viewed the world. When I was in elementary school all I cared about was what they were serving for lunch at school (Salisbury steak and buttered noodles were always a favorite). In junior high I realized that I’d probably better start learning something and was baffled by the concept of negative numbers. In high school and college I studied way too hard to get to where I am today, not even using my degree. I thought people who were forty were so old and couldn’t fathom being that age, and I still can’t imagine what fifty will feel like. Sadly, I have only a handful of photos to document what the world looked like through my eyes during those years. I didn’t have a camera back then, let alone a Leica like this girl. The color of this diptych really adds a nostalgic feel, as if these photos could have been taken thirty years ago. The candid aspect of these photos truly captures her innocence and curiosity, something many of us lost long ago. 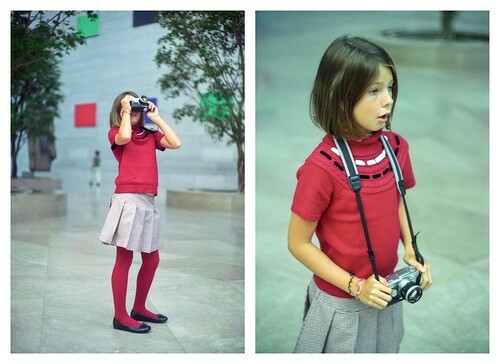 Will she look back on these exposures when she’s an adult and remember her time at the National Gallery of Art? Will she carry her passion for photography into adulthood? Will her curiosity continue to make her look at the world in different ways? For the sake of everyone, let’s hope so. I make it no secret that I believe Jazz is an underappreciated portion of American music history by the millennial generation. With that said, I shared with you one man’s love for the trombone and how he brought it to the forefront of band leadership. 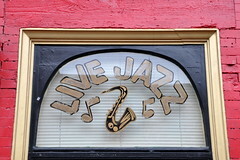 Now, I ask you to give something a try (if you’ve never done so before) … go see some live Jazz. 1) Doc Scantlin and the Imperial Palms Orchestra – Doc means business. His band is considered a Jazz institution in the area, having been around for a decade now. Their specialties include anything from the 1920′s, 30′s and 40′s. Their final performance at the Carlyle Club (where they play live every Friday unless their on break or on tour) until June 18 is tonight at 8 pm. Tickets are required but the Carlyle Club is a dinner club as well, so come and make an evening of it. I’ll be there! Ticket information is available on the Carlyle Club’s website. Last night at the Corcoran Gallery of Art, the stars aligned. 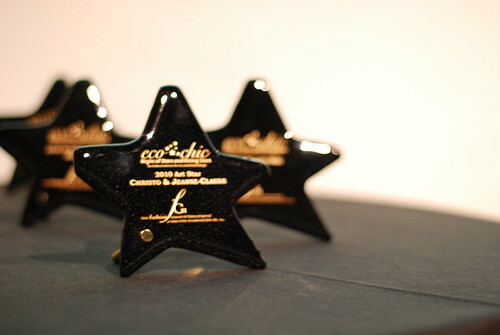 Bringing together pioneers of the environmental movement in fashion, art, beauty, architecture, and interior design to celebrate the event, “Eco Chic: Night of Stars and Rising Stars”. The occasion, held on the eve of the 40th anniversary of Earth Day was the first of its kind; promoting awareness of Eco and Ethical Design, while recognizing the exemplary efforts of a few, key professionals on their pursuit of excellence. 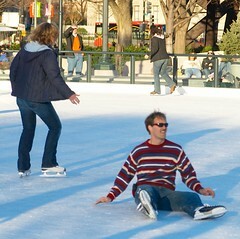 Sculpture Garden Ice Rink Opens Thursday — It’s About Time! The wait is over. Technical difficulties are through. The coolant system has been repaired! The Sculpture Garden ice rink will FINALLY open on Thursday. If you need more of an incentive to venture out into the bitter winter weather, the fine folks at the National Gallery of Art will have a free cup of hot cocoa waiting for paying rink customers on Dec. 12-13. 10:00 a.m. to 9:00 p.m.
10:00 a.m. to 11:00 p.m.
11:00 a.m. to 9:00 p.m. Remember: it’s $7 for adults/$6 for skaters 50+, children 12 and under, or students with valid school ID. Each session lasts two hours and starts at the top of each hour. So pull that sweater your aunt knitted for you out of the closest, throw on that down jacket, and lace up those skates — it’s time to rip up some ice! Two current exhibits at the National Gallery of Art are at first glance dissimilar. 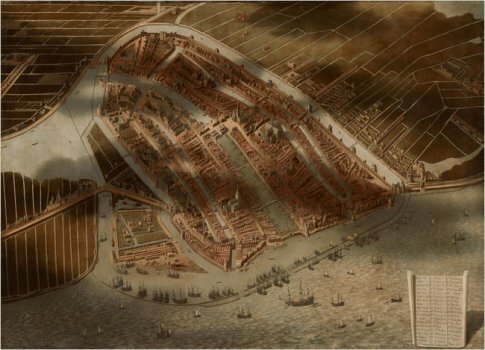 “Pride of Place: Dutch Cityscapes of the Golden Age,” is a tightly restrained showcase of the grand Dutch Republic’s view of its cities and public spaces, using cartographic metaphor to show a mighty macrocosm at its seventeenth century height. “Looking In: Robert Frank’s The Americans“ takes on our own republic from a microcosmic perspective, capturing in lush yet depressing detail the consumerist chill of 1950′s America. But seeing both exhibits in the same afternoon gives you the sense of how art can mirror culture – either cleaning up reality, or showing the truth beneath. One of the most incredible sights in my life was watching angry red streaks of lava etch the side of Mount Etna. I was on my way to the Catania airport during a vicious rainstorm. As the lightning crackled through the dark sky and the burning streams pulsated, the laconic driver assured me in typical Sicilian fashion – “c’è normale” – that’s nothing, it’s normal, it isn’t even a “real” eruption. My heart was racing even though I was safely miles away from the volcano, so awesome was the power of nature. So I can only imagine how more horrifying the power of Mount Vesuvius was when it erupted in AD 79. But the people of the Bay of Naples still live under its threat, no doubt echoing their Sicilian counterparts in thinking, “c’è normale,” even with the ruins of Pompeii and Herculaneum close by to remind them. 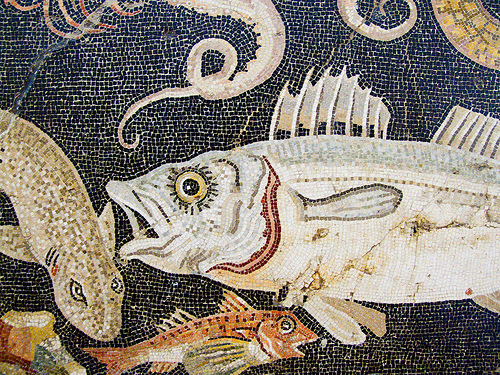 Pompeii and the Roman Villa: Art and Culture Around the Bay of Naples, at the National Gallery of Art, cleverly lulls you into a similar state of complacency. The exhibit first highlights the decorative art of Pompeii and the surrounding area, taking you through the various rooms and courtyards of a typical villa of the Roman Empire. Only at the end are you hit with a dark room and depictions of volcanic explosions, a haunting evocation of “La Civita” – the lost ancient city. DC Mythbusting: The Height Limit!